If you have a growing collection of new and used books you would like to get rid of, there are several online options beyond traditional used bookstores. These websites can be especially useful if you do not live in a major city with more physical stores where you may be able to sell your books. You don't need to be a business to sell on Amazon. Regular people sell individual items all the time on the popular website. You may have even noticed when you were shopping yourself that the same item was being sold by multiple sellers. Amazon offers two different seller plans: individual and professional. With the individual plan, you don't pay any monthly subscription fees, but you do have to pay 99 cents for each item you sell. This fee is only collected when the item is sold. With the professional plan, you pay a $39.99 monthly subscription fee, but you do not pay for individual listings. In both cases, you may also have to pay referral fees and variable closing fees. Check the full Amazon Fee Schedule for detailed information. The main advantage with selling your books on Amazon is you set your own pricing. However, you only get paid when someone actually buys your books. If you would rather not wait until your book is actually purchased, the Amazon Trade-In Program may be a better option. You send in your books - as well as other eligible items like Kindle devices and video games - and Amazon will process your shipment typically in 10 business days or less. Once processed, you are provided with an Amazon gift card for the trade-in value. You do not receive a cash payment. This is a good option if you already shop on Amazon regularly. 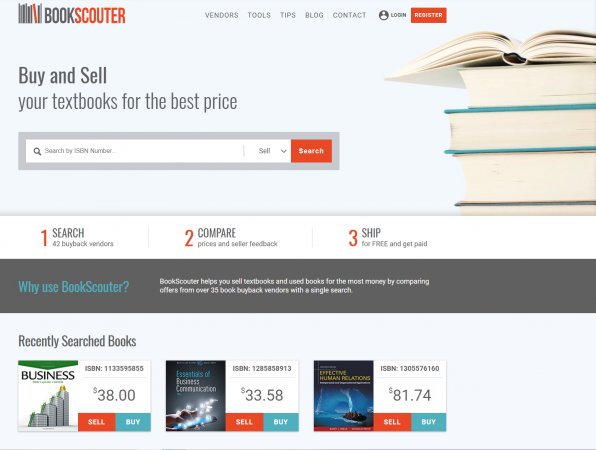 Even though BookScouter positions itself as a website where you can "buy and sell your textbooks for the best price," it is equally useful for a broad array of other books too. BookScouter doesn't actually buy or sell books itself. Instead, you enter the ISBN of the book you'd like to sell (or buy) and the site automatically compares the title across over 40 buyback vendors. There is also a handy mobile app you can use to scan your books. You are shown a list of vendors who are willing to buy your book and for how much. From there, you click on the corresponding "sell" button to be redirected to the vendor's website to complete your transaction. Keep in mind that many buyback vendors have minimum order requirements, so you oftentimes cannot sell a single book. MoneyPantry calls BookScouter one of the "best places to sell used books for cash." It doesn't cost you anything to get started with Decluttr. You can use the website not only to sell books, but also CDs, DVDs, video games, Blu-ray discs, technology items, and LEGO. Enter the full bar code of the items you wish to sell and Decluttr will provide you with an instant price quote if they are willing to buy it from you. Like BookScouter, Decluttr also has a mobile app for scanning bar codes. After completing the forms online, you pack all your items into a box and send them to Decluttr using the provided free shipping label (UPS). Each order must have a minimum of $5 in value and cannot contain more than 500 items. If you have more than 500 items to sell, you will need to create more than one order. Even if you are not in Oregon and cannot visit one of the physical Powell's Books locations in Portland, you can still sell your books online. All you have to do is enter the ISBNs of all the books you would like to sell, and the online tool will tell you how much they are willing to pay you for each title. You will also be shown a list of books they "will not accept at this time." Keep in mind Powell's is very particular about book condition. Powell's Books can pay you in PayPal funds or in Powells.com virtual credit to spend in their online store. The minimum requirement for selling books to Powell's is at least $8.99 in credit or seven books in the order. Like Decluttr, you will also be given a free prepaid mailing label for shipping your books via UPS Ground. Anyone can sell to Powell's, but the free shipping offer only extends to the United States. 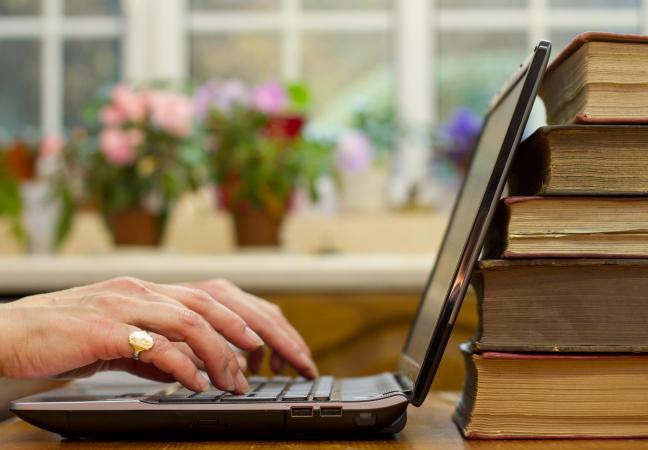 Whether you only have a small handful of books to sell or you've been put in charge of liquidating an estate, selling books online is quick, efficient, and convenient. However, don't expect to get rich as many books may only fetch very modest amounts of money if they even qualify at all.